A simple example that shows how to cut the biggest blob on a video image and that renders it as a textured/filled polygon. A slightly more complex example that is based on the previous one. 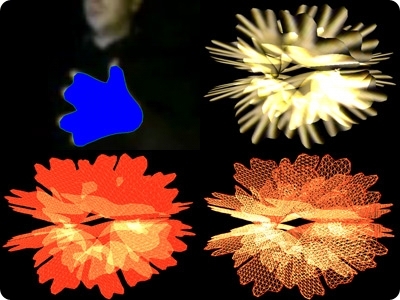 The biggest blob on the video feed is cut and rendered in 3D with rotation and translation transformations alongside with some additive blending effect (as shown on screenshot). Both applications were programmed with Processing 0098 Beta. Unfortunately, I wasn’t able to export them to exe… Seems there is some kind of path problem, all I get (on PC) is a black window. Argh. Bug reported there.